Easy Vietnamese Caramel Salmon – The most delectable, flaky melt in your mouth savory salmon. Ready in under 30 minutes. Can be made in the oven or in an Instant Pot (instructions for both cooking methods included in recipe). Something magical happens when salmon is cooked is a blend of soy sauce, Asian fish sauce, lime, ginger and brown sugar! It’s like the sticky caramel ginger goodness gets infused into every possible nook and cranny producing some of the most tender flavorful salmon I’ve ever had! VIETNAMESE CARAMEL SAUCE! Yes, I just put that all in caps, because it’s that good! You’ve heard me rave about it here before when I shared the recipe for Vietnamese Caramelized Pork and was going on and on about just how tasty this sticky caramel ginger sauce really is. So, it was pretty much a no-brainer when I came across this recipe for Vietnamese Caramel Salmon in Melissa Clark’s new book Dinner In an Instant that I was going to HAVE to try it out. Melissa’s version in the cookbook is for the Instant Pot but I’ve also made this in oven (because..yes! the sauce really is that good and if you don’t have an Instant Pot you still NEED this ). I’m including recipes for both cooking methods below. This recipe like many Asian dishes calls for Asian fish sauce. I’m guessing this may be an item many are not familiar with and may be wondering what is it? do I need it? and where can I buy it? What is Asian Fish Sauce and do you really need it? If you’ve ever had Pad Thai at your favorite Thai restaurant then you’ve probably already experienced Asian fish sauce, as it is a key ingredient to the savory flavors of that dish and many other Asian, Vietnamese and Thai dishes. As the name implies Asian fish sauce is indeed made from fish (usually anchovies) that are salted and left to ferment for a period of months or years and then pressed. I know! that might not sound all that appealing but remember Worcestershire sauce also has an anchovy base. 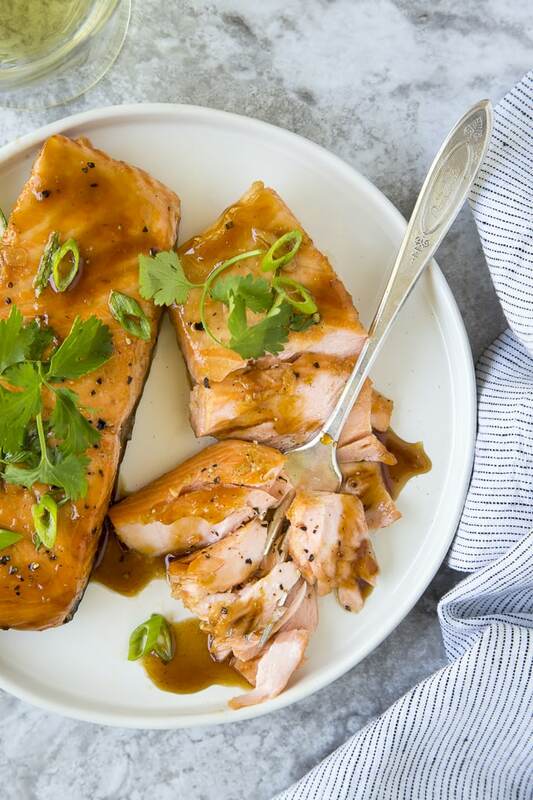 If you’ve ever experienced just how much a dash of Worcestershire can do for a Bloody Mary or a Caesar salad then you’ll certainly understand why just a splash of Asian fish sauce can take this Vietnamese Caramel Salmon to the next level. Asian fish sauce (just like Worcestershire sauce) adds “umami” ,a depth and savoriness, without tasting “fishy”. Umami is one of the five basic taste profiles (which also includes sweetness, sourness, bitterness and saltiness). Asian fish sauce does have a pungent smell if you smell it straight out of the bottle but don’t worry it doesn’t have an overly fishy flavor at all once cooked. In this particular recipe the Asian fish sauce is a key ingredient and I would highly suggest picking up a bottle. You should have no problem finding Asian fish sauce at well stocked grocery stores in the International section ( usually near the soy sauces) , at your local Target ( if they carry food items) or on Amazon. You’ll probably find Asian, Thai, or Vietnamese versions of fish sauce and any will work, and most are only a couple of dollars. There are so many things you can do with Asian fish sauce! Check out this article from Serious Eats for more ideas. Asian fish sauce can be used in things like marinades, soups & stews, salad dressings, fried rice and more. 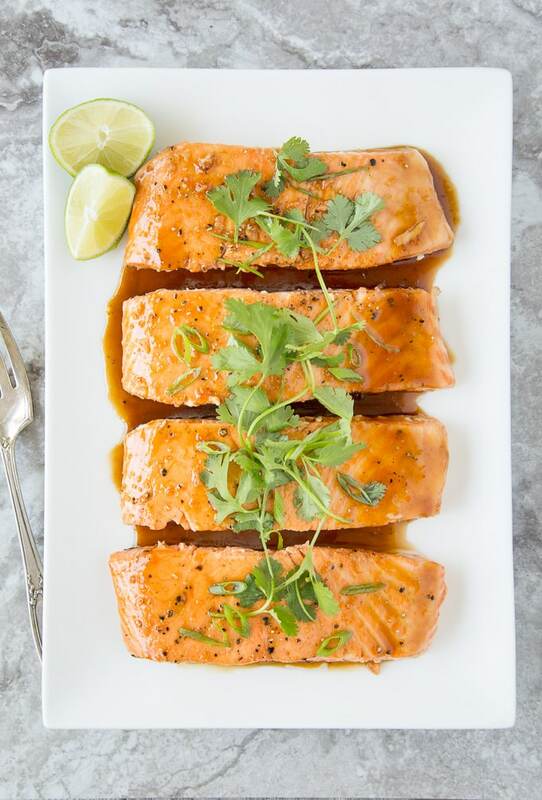 Cooking salmon in Vietnamese Caramel Sauce either in the Instant Pot or oven insures the most flavorful, delicate, flaky melt in your mouth perfect salmon! Easy Vietnamese Caramel Salmon - The most delectable, flaky melt in your mouth savory salmon. Ready in under 30 minutes. Can be made in the oven or in an Instant Pot (instructions for both cooking methods included in recipe). 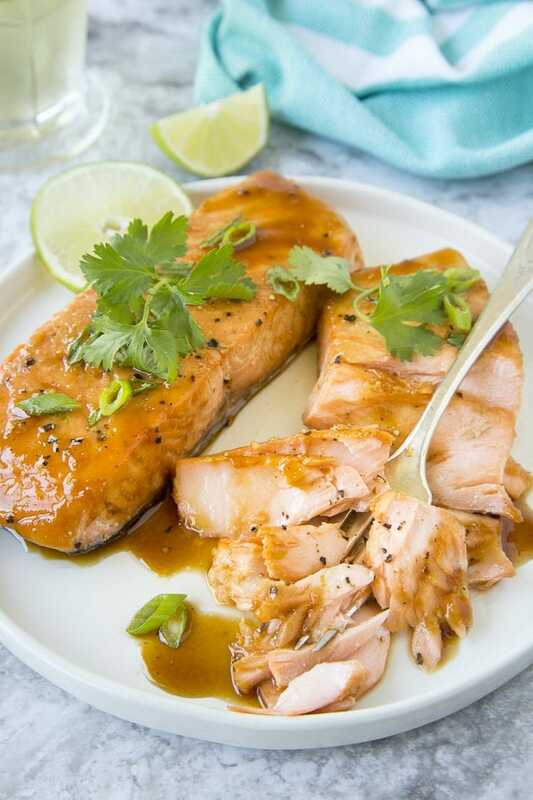 In an oven-proof baking dish (large enough for salmon fillets to lay flat) combine oil, brown sugar, fish sauce, lime juice, soy sauce, ginger, lime zest and pepper. Lay salmon fillets in baking dish with sauce (flat side with skin facing up). Bake for 20-25 minutes. Carefully remove salmon from baking dish, flipping salmon over so that the flat side (skin side) is on serving platter (reserving sauce in baking dish). Set oven to broil. Place baking dish with remaining sauce back into the oven (about 6 inches from heat) for an additional 1-2 minutes to thicken sauce. Remove baking dish from oven and spoon sauce over salmon. Garnish with fresh cilantro and green onions. Set Instant Pot to sauté function. Add olive oil, brown sugar, fish sauce, lime juice, soy sauce, ginger, lime zest and black pepper. Mix and bring to a simmer. As soon as mixture starts to simmer, turn off the sauté function. Add salmon, skin-side up. Spoon sauce over salmon. Set Instant Pot to Manual and cook on low pressure for 1 minute. Allow pressure to release naturally for 5 minutes; then set pressure release to manual and release any remaining steam. Check salmon for doneness, if necessary (if filets are extra thick) cook an additional minute or so using the sauté function. Lift the salmon (carefully) onto a serving platter, flipping so that the skin side is down and the browned, caramelized side is facing up. Set Instant Pot to sauté function one final time, allowing the sauce remaining in the pot to reduce and become thick and syrupy (about2- 3 minutes). Spoon sauce over salmon and garnish with fresh cilantro and sliced green onions ( both white and green parts). Drizzle with additional lime juice if desired.